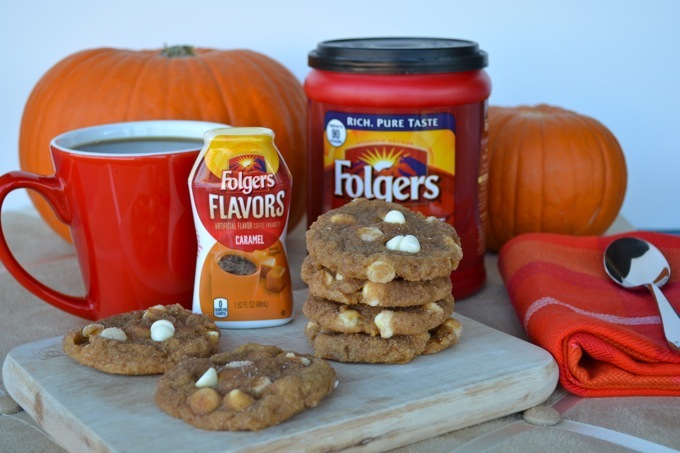 I customized my coffee using Folgers Flavors, as part of a sponsored post for Socialstars #remixyourcoffee. All opinions are my own. Today we are talking about the life-sustaining nectar we like to call coffee. Something which I could probably not live without. Or at least, could not live happily without. Nick has certainly learned to steer clear of me before 10 am if I have not had my coffee. It’s not pretty. In my opinion, the only thing better than a good cup of coffee is a good cup of flavored coffee! Hazelnut has always been my personal favorite but I’ll branch out to other flavors as well. Lucky for me, Folgers has come out with Folgers Flavors, a new line of convenient, portable flavored coffee enhancers that you can add to any cup of coffee. So you can add a little, add a lot, or customize your coffee however you like! 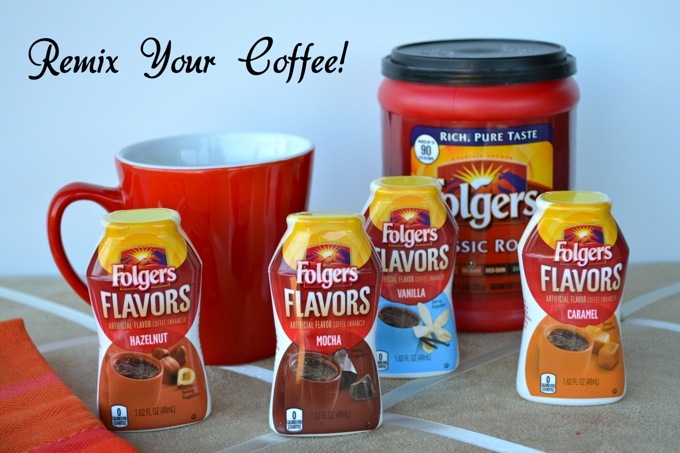 Folgers Flavors comes in 4 flavors– hazelnut (my favorite), vanilla, mocha and caramel. The 1.62 fluid ounce bottles are the perfect size to stash in your purse, desk drawer, glove compartment, or anywhere else that you may run into a mediocre cup of coffee that needs some remixing. Turning office or gas station coffee into a delicious vanilla dream? Yes, please! I tried the hazelnut flavor first, of course, in hot black coffee with my breakfast this past weekend. One squirt made a perfectly flavored cup in seconds. The hazelnut Folger’s Flavors smells amazing, by the way. The second it hits the hot coffee, it smells just like you’d brewed a pot of hazelnut beans. Coffee is great in the morning, but it’s also a perfect as an afternoon pick me up or complement to dessert. I usually brew a whole pot of coffee in the morning, then let the leftovers cool and stick it in the fridge for iced coffee later on. It’s perfect for battling an afternoon slump. 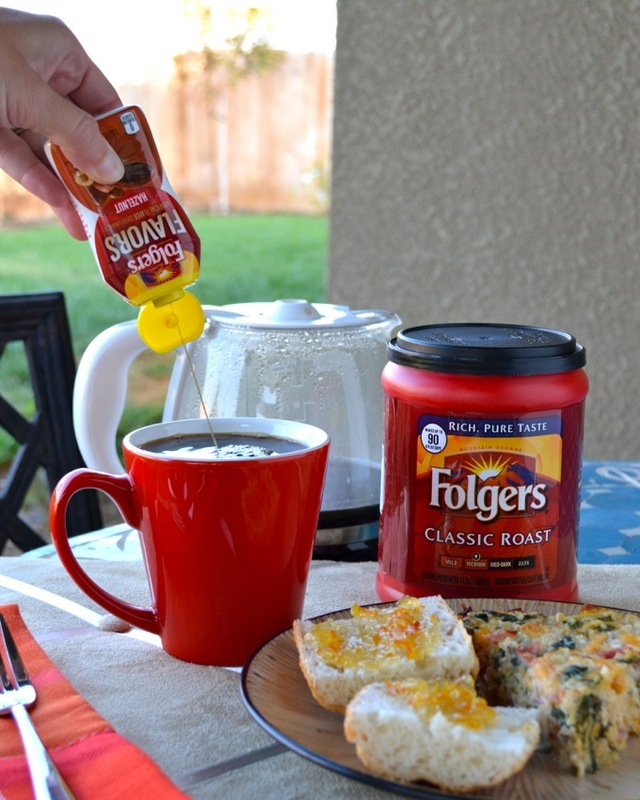 Folgers Flavors is great for quickly adding whichever flavor I am feeling at the time! 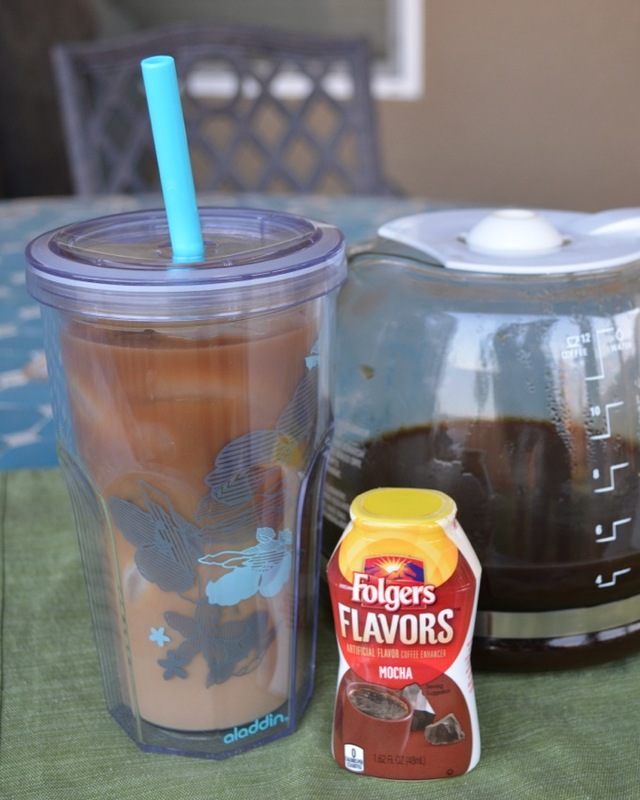 I like my iced coffee a little creamy, and I remixed it with the mocha Folgers Flavors. It was an awesome afternoon treat that even felt a little indulgent. I thought the caramel flavor sounded like it would go perfect with dessert! When I think of caramel I think of caramel apples and fall. A seasonal dessert like these White Chocolate Pumpkin Snickerdoodles seemed like the perfect pair. The sweetness of the cookies really brought out the caramel flavor. If you want to try them, check out the recipe below! In a bowl, mix together butter, brown sugar, and 1/2 cup granulated sugar until smooth. Add the vanilla and pumpkin and continue mixing until well incorporated. In another bowl, combine flour, salt, baking power and soda, 1 1/2 tsp cinnamon, all spice, cloves and nutmeg. Add the dry ingredients to the wet and mix well. Fold in the white chocolate chips. Refrigerate dough for at least 30 minutes. Preheat oven to 350 degrees. Combine the remaining sugar and cinnamon in a small bowl. Roll 1.5 tbsp scoops of chilled dough into balls. Roll balls in cinnamon sugar, thoroughly coating. Place on parchment or silpat lined baking sheets and flatten slightly. Bake 8-10 minutes. Cookies may look underdone, but you don’t want to overcook them! Let them rest on the baking sheet for 10 minutes before moving to a cooling rack. The cookies will supposedly stay soft and chewy for up to a week… I can’t confirm this because they didn’t last more than a day in my house! 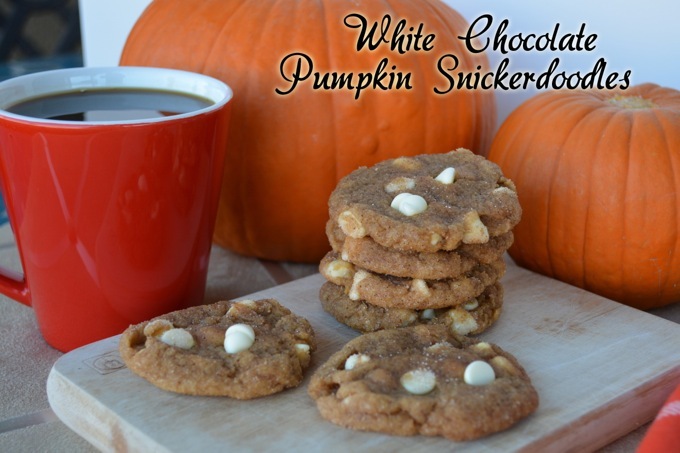 These cookies are amazing and definitely my new favorite fall treat. Thanks to Folgers for inspiring me to bake them! If you want to keep up with Folgers you can find them on Facebook and Twitter. I really enjoyed trying Folgers Flavors. I love that you can choose a different flavor every day of the week and it’s so quick and easy to enhance you coffee! What’s your favorite flavored coffee? Can you live without it? Are you ready for pumpkin season?! Nothing better than pumpkin flavor this time of year! Just seems to go right along with fall and holidays! Flavored coffee is my favorite! I didn’t know foldgers came out with those flavor bottles, so I will have to check that out! And these pumpkin snickerdoodles sound awesome, Jess! Definitely my favorite cookie, especially with the white chocolate added in! I love flavored coffee can’t wait to try folders new flavors. Mocha is my all time favorite, but I might just try all 4 flavors. I have not seen these but I am so interested! Cannot drink black coffee so these would be so perfect. I would love to try all of them! I can’t start my day without my coffee. I love my morning cup of coffee, and I enjoy trying different flavors added to my coffee. These sound delicious.. I love flavoured coffee too and definitely am wanting to try all of those flavours now too! These sound very good and easy to carry everywhere you go. Can’t wait to try them all. What a neat blog. I drink Folgers instant already….now you have me dieing to try the flavors. Good job!! Hazelnut is my absolute fav! Sadly I’m allergic to Hazelnut but the snickerdoodles sound so good. I think I’ll have to try that recipe sometime. Oh and my favorite flavor for coffee is Peppermint Mocha though Pumpkin spice is a close second! Ahhh!!! I would be so sad to be allergic to hazelnut!! Peppermint mocha is definitely one of my favorites, though!! Flavored coffees are one of my favorite things to enjoy in Fall. Thanks for sharing the cookie recipe! I love Pumpkin anything, I don’t care, if they made Pumpkin perfume I’d probably wear it! Holidays coming up and my house is pumpkin from top to bottom! It’s finally the season so I don’t look completely ridiculous with my Pumpkin everything!